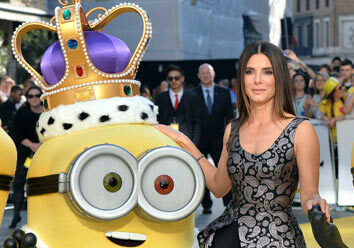 Sandra Bullock on playing Minions villain: "It’s more fun to be mean and crabby..."
Academy Award-winner Sandra Bullock (The Blind Side, Gravity) stars in Universal Pictures’ Minions as Scarlet Overkill, the world’s first female super-villain. Minions Kevin, Stuart and Bob are drawn to Scarlet for her ability to mastermind incredible heists, and they are simultaneously terrified of and smitten by her. She hires the Minions as her henchmen and charges them with their first mission: to embark on a criminal heist that takes them to London as she attempts to achieve her lifelong dream: becoming the Queen. Casting Bullock as Scarlet was an early idea from Meledandri, who hoped to juxtapose her approachable sound with the heart of a character bent on revenge and power assumption. His logic was that if Scarlet were voiced by someone with a more diabolical bent, you’d know within an instant for whom you should root. But with a performer so inherently likable as Bullock, fans will find themselves occasionally rooting for her. As Bullock discussed Scarlet’s backstory with the filmmakers, she learned that Scarlet’s rise to power actually made quite a good deal of sense. Growing up, Scarlet had nothing. She had no friends, no money, and she looked at the Queen as a woman of ultimate power. While many girls want to be the princess, Scarlet quickly realized that princesses have no power. With a pathological need to be loved and respected, Scarlet aspired to be the woman telling the princess what to do. Truly, if the Queen says something, you do it. She loves the Queen, and so she thinks people will love her if she has that crown. Opening across the Philippines on July 8, Minions is distributed by United International Pictures through Columbia Pictures.